History repeats itself on October 30th. Zone of the Enders HD Collection arrives on PS3 and 360 on October 30th. In a cute nod to the original PS2 release of the Kohima-helmed mecha game, the HD collection includes a demo of Platnium Games' upcoming Metal Gear Rising. PS2 era gamers will remember that Konami promoted the then-unknown franchise by including a demo for the long-awaited Metal Gear Solid 2: Sons of Liberty. While neither of the Zone of the Enders games sold especially well, they did develop enough of a cult following to warrant a HD re-release. The HD collection includes the original Zone of the Enders and the European special edition version of Zone of the Enders: The 2nd Runner. Konami's most recent entry into the HD re-release market didn't go particularly well. Silent Hill HD Collection suffered from a slew of technical problems which eventually resulted in the publisher offering exchanges to customers who bought the 360 version. 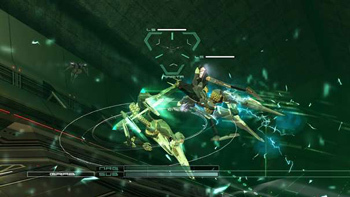 While that collection was ported by a third party, Zone of the Enders HD Collection was developed in-house at Kojima Productions. According to an announcement from back in May, a new Zone of the Enders game is in early development.